Members of the Van Horn Community Coalition gathered to present the school supplies collected during the recent school supply drive to the staff and students of Culberson County – Allamoore ISD. Cash donations were also turned over to the school to help supplement the school supply closet. The citizens of Van Horn generously donated to provide essential school supplies to students in need. 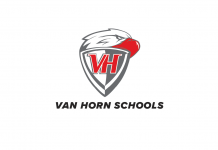 CCAISD will be maintaining a school supply closet, and the Van Horn Community Coalition will be collecting additional supplies throughout the year. CCAISD also maintains a clothing closet to help outfit students. They are accepting new or gently-used clothing and shoes. And as colder months are approaching, sweaters and coats will also be in high demand. Contact CCAISD for more information regarding the donation of clothing. And be on the lookout for collection stations for additional school supplies in October. Van Horn Community Coalition meets Thursdays at 7:00 p.m. at El Tomate Pizza Shop. The mission of the Van Horn Community Coalition is “to provide a network of support, motivation, and accountability while aspiring to enrich the community.” New members are always welcome. Contact Jesus Ramirez at El Tomate for additional information.